Marshall Field actually made time for something that day beside his store. Fireworks. He was on his way to see some that evening. Half a day had been wasted for Field by that bothersome harridan in his front office. The night's festivities promised to make up for the day's frustrations. Everybody was mad about fireworks that summer in Chicago. Even the normally dour Mister Field. The Fair and all the trimmings were a booster's dream. One of the fireworks was a tribute to that noble animal upon whose back Chicago fortunes were being amassed. The marshals searched for suitable titles and called this display The Apotheosis of the Cow. Where else but in Chicago could one see the Apotheosis of the Cow? There were some things that even New York and Boston had never dreamed... Bertha Palmer, who co-marshalled the great display in honor of Columbus and Chicago, saw the cow symbolizing Chicago jump over the moon. Kids around her in the stands sang, Ten dark nights when we were all in bed, Missus O'leary lit a lantern in the shed... And so on. The popular ditty rippled among the half million people packed into the Court of Honor on the lakefront. Maybe it was an exorcism of the fire, that song. They sang, hummed, and watched Missus O'Leary's fabled cow kick sparks across the sky that early summer eve. Nobody questioned whether it was fitting to honor the cow that had started the Great Chicago Fire of 'seventy-one. The fact was Chicagoans were amazed at all they had done in those intervening years. To be the host city of a world's fair a little over twenty years after the Great Chicago Fire? Nothing to it when one has a plan, Bertha Palmer was heard to remark. Chicago was getting to be known as a town that could deliver the goods. In this case, ornamental explosives. The papers gleefully gave a firework-by-firework account. Every holiday they did that. All summer long. Massive displays competed with each other month by month. Of course, the Board of Managers reminded everyone that the World's Columbian Exposition was the World's Greatest Event. No grounds and buildings, no fireworks like these, had ever been seen by man. Nor were they likely to be seen again. Except by Bertha Palmer. She had her own set to contend with. "Poise, thy name is Bertha" could have been Missus Palmer's motto. And nobody got the better of her either. With fireworks or without them. This was partly because Bertha was not easy to get near. Calling cards were passed through a dozen servants' hands before Bertha Palmer decided the fate of a would-be visitor. Since Bertha had become the head of the Board of Lady Managers of the Fair, her husband Potter was lucky he wasn't screened. Bertha didn't resort to the imperial "we" to get her way. She didn't need to. Who would ever dream of contradicting a statuesque society queen whose hair resembled a corsair floating on a sea of expensively crimped waves? A woman who loomed above housemaids and reeked of well-tailored charm. And jewelry. Bertha almost invariably wore a dog collar of diamonds. The sight of that glittering neck alone was enough to settle many a dispute. Sophia Hayden, the architect of the Women's Building for the Fair once had the audacity to cross Bertha in a major way. The young woman had her own ideas about the interior detailing. But Bertha knew what she wanted and Miss Hayden's services and advice were not it. The crushed architect returned to her hometown. Reports came to the Board of Lady Managers that Sophia Hayden had gone hopelessly insane. Later Sophia recovered enough to marry some artist named Bennett, but she was out of architecture for good. Bertha Palmer had little use for such human frailties as Sophia Hayden's. Like a cutter plowing through uncharted seas, Bertha knew that she was a pathfinder. After this Fair, not only would trade be on a more global scale, but the millions of foreigners trooping through the Fair would have to concede that America had reached cultural maturity. So what if a few women architects got neuroses along the way. What did these women think life was? Some parlor seance or knitting circle? Indeed, Bertha knew herself so well that she had little patience for all the ardent feminists who ran around in ill-fitting tea dresses, proclaiming the advent of The New Woman. Bertha, from a well-off Huguenot family, had her feet on the ground. "One hears so much of the new woman that one is in danger of being bored by her unless she arrives quickly," Bertha told dinner guests one night as her dog collar sparkled in the candlelight. In the Windy City there were few who could best Bertha Palmer in a battle of wills. Few would even try. Only twice did Bertha run up against a brick wall during the Fair. Little Egypt was the first brick wall that Bertha knocked into. When the Board of Lady Managers walked through the preview of the Midway International Village they were appalled by the dancer. Naturally, Mayor Carter Harrison heartily approved of Little Egypt and every other belly-button-showing exotic female at the Fair. The Mayor's attitude only convinced Bertha that she had been right about that man all along. Bertha immediately rushed back to her office. She drafted an official report on the danger to morals that Little Egypt and her ilk represented. "No ordinary Western woman, wrote Bertha who was speaking for them all, could look on these performances with anything but horror. 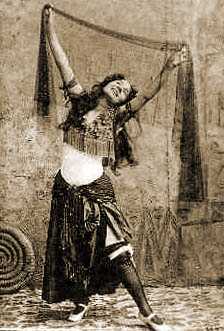 The girl revolves and turns, her face assuming a dreamy smile, her painted eyes half closed... as she begins the contortions that mark all the Oriental dances; her movements are snakelike and vulgar." That says it all, Bertha thought, and slapped the report into the hand of Harlow Higginbotham, President of the Board of Managers. The Managers took up Bertha's remarks in a desultory way. Charles Yerkes, whose hobbies were collecting paintings and women, made a couple offcolor remarks that sent the puritanical Mister Field into a fit of coughing. The objections had come too late for the Managers to cancel the binding agreements that had been drawn up with the government of Egypt, said Mister Higginbotham. Yerkes was pleased to hear it. Field made no comment, but contented himself with a loud honk of his nose. The Lady Managers would not like to cause an international incident over such a trifle, would they? This was the message that Mister Higginbotham sent back to Bertha and the Lady Managers. Bertha didn't mind if they did, but no one followed up on her idea. When opening day came, Grover Cleveland himself walked into Cairo-on-the-Midway and paid his dime with all the other oglers, gawkers and curiosity seekers. Bertha preferred to part company with the President at this juncture. She had better things to do. That Dreadful Little Egypt continued to be a thorn in Bertha Palmer's side. But Bertha was never one to give herself up to senseless brooding, so she looked for a big project to cheer herself up while raising the cultural tone of Chicago. A royal visitor was coming. If that couldn't take one's mind off Little Egypt, nothing could. Hobart Chatfield-Taylor called on Bertha in her Louis XVI salon. New York had been blessed with Ward McAlister to tell everybody what was good taste and how they should live. Hobart Chatfield-Taylor filled this thankless post for Chicago. In addition, Mister Chatfield-Taylor was the ambassador to Spain. He asked how plans were progressing for the reception for Eulalia, the Spanish Infanta. No one could say Bertha Honore Palmer was not generous. The reception was to be held in Bertha's own gothic salt shaker of a house. Palmer Castle. Even now Eulalia was whizzing across the countryside to Chicago in a Pullman palace car. So they had better hustle. And her name must be pronounced Ay-oo-lay-lya, Chatfield-Taylor reminded Bertha. Going around and saying Ay-oo-lay-lya at everybody was becoming such a nervous habit for Hobart that Bertha had the urge to slap him a few times on the back the way she would a hiccoughing child. Hobart stroked his chin as Bertha enumerated all the necessaries for the royal guest. "And the coach?" Mister Chatfield-Taylor queried Bertha with raised eyebrows. First impressions could make all the difference. The coach would be the very best brougham that Madame Palmer owned and would be drawn by four chestnut horses. "But what about the Mayor and his hat?" Bertha shot back at Hobart. She was truly worried about that mayor. Why, the man owned a hotel of ill-fame on Polk street. And the females who stayed there were even homely ones, by all accounts. Whatever could one do with such a person? 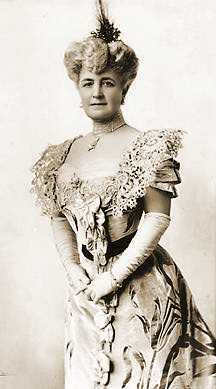 Chatfield-Taylor interrupted Bertha's misgivings to say that His Honor was going to discard his trademark slouch hat for a silk top hat in honor of the Infanta. "He may even get a close beard trim." Bertha permitted herself a smile. The Infanta arrived the first week of June and was kept on ice by the tireless Bertha until the day she was due to open the Spanish Building at the Fair. Periodically, servants were sent out to comb the shops for the Infanta's favorite brand of Spanish cigarettes. Otherwise she made a scene. In Pennsylvania they had had to stop the train while her entourage got off. The Spaniards combed Mars, Pennsylvania, for Spanish cigarettes. Amazingly, they found some; otherwise, the train might still be sitting out in the cornfields. That princess certainly was an individualist. She was always lighting up at public affairs where she was sure to offend. It didn't bother the Infanta whom she offended because names like Adlai Stevenson, Marshall Field, Robert Todd Lincoln and so on, were all nonsense syllables to her. Setting her foot onto the soil of Chicago, the Infanta told Hobart Chatfield-Taylor to call off the troops. There literally were troops, a squadron of cavalry, but this was not what Eulalia had on her mind. She wanted to be left alone and to be able to see the Fair like a normal human being. She huffed and sulked her way through the official reception at the train station. The cavalry cantered. The hussars trotted and saluted. Cannons were fired. She wondered when it would end and tapped her doll-sized foot. The welcoming was headed by Mayor Harrison, Allison Armour and Hobart Chatfield-Taylor among others. After a long and boring ceremony, Allison Armour offered to take the princess to the Fair on her father's steam-powered yacht. This worked like a charm. They docked away from the public piers and the princess got around for two hours before the press caught on. The Infanta slurped up coffee in the Viennese Cafe. She drank beer in the beer gardens. She watched Little Egypt gyrate. She ignored the Court of Honor and its cluster of pseudo-Greek buildings which she would have to see later, anyway. Meanwhile, the prince visited the stockyards and went shopping at Marshall Field's store. Then he had most of his beard shaved off in the Palmer House barber shop. The famous barber shop whose floor was inlaid with silver dollars. The prince watched his whiskers fall onto those coins and wondered at the interesting decor. He asked the barber if his tiny beard made him look more like an American. The barber said that it did. So, the prince took off roaming the city by night like the old caliphs. He visited the Levee, but didn't mention it to the princess. Anyway, she wouldn't have cared. Meanwhile, Eulalia decided she was not having fun yet. She had heard the whispered report from one of her ladies that Bertha Palmer was the wife of an innkeeper. "Innkeeper?" The word reverberated around her plush suite. She might have figured this out by herself by the suspicious name of the place that she was staying: the Palmer House. Not willing to be caught napping a second time, Eulalia insisted upon passing on the guest list for the Higginbotham's dinner a week before she attended. Bertha Palmer is unavoidable like the smell of the squid, thought Eulalia, gloomily. Therefore she didn't bother to object to her presence at dinner. But. . .what was this seating chart that had the Infanta of Spain next to this Mayor Harrison person? No, no, the princess would only sit only next to the gobernador. Or nothing. But the gobernador at that moment was John Peter Altgeld, a mild socialist who was unpopular because of his handling of the Haymarket defendants. He had pardoned the men. Due to this apparent political blunder, Altgeld was staying away from official Chicago that summer. Gobernador, gobernador, insisted Eulalia as she tapped her little foot. They compromised and Eulalia was to be seated next to a bishop, even though she made it clear that she would have preferred a cardinal. But first there was the Palmer reception to get through. The reception at Bertha Palmer's got off badly from the start. On her way out from the Palmer House, Eulalia noticed that no red canopy was put out for her. She ran back to her suite until one was scoured up. By then, she was an hour late and this did not endear her with the crowd outside the Palmer mansion. It was pouring rain. Eulalia had made not the slightest concession to Chicago weather. Her dress was very d�collet�. Her slippers were not waterproof. Her floor length silk train was white, less so by the moment. By the time she bore down on the unflappable hostess who had come outside to greet her, Eulalia was ready to spit nails. Bertha pretended not to notice the steam pouring from the Infanta's delicate nostrils as she extended a gloved hand to the lady. She and her suave Quaker husband Potter were charm incarnate. Potter gave a deep bow and said how glad he was that her highness could grace their home. The princess looked past the couple and started up the stairs at a trot. Guests had been ordered not to shake the Infanta's hand like a pump handle, so there was a lot of awkward ducking, bobbing and attempts at curtsying in the reception line. Eulalia sulked and stared over the heads of the smiling faces who swam into her view. Once, she snapped out of it because some guest reminded her of her dearest sister... but this mood didn't last long. The women were so tightly laced up in their corsets that a few of them fainted in the line. This was usual. Their escorts brought over the smelling salts. Bertha did not know what awful thing to expect from the evening, so she had engaged an off-duty detective to be on hand. She looked down at the card in her hand. Clifton W. Wooldridge, said the card. It bore a small likeness of him and had across the bottom : WORLD'S GREATEST DETECTIVE. Bertha looked about nervously. The Infanta or one of her ladies could be robbed of a bit of jewelry. Eulalia would probably declare war. What a worry. One never knew how, but thefts often happened at these large affairs. Temporary immigrant help. There was plenty of that. Girls were swirling among the guests in black pinafores over white blouses with high lace collars. Nowhere among the guests could Bertha spot The World's Greatest Detective. She was relieved that he wasn't so noticeable, because the man's disguises were never convincing. Bertha had seen Wooldridge at several balls attempting to pass as a Gold Coast dandy by slicking his hair down and parting it in the middle. He usually waxed his moustache until it stuck out in points like a stage villain's. Worst of all, he had worn an old cut away coat which had a greenish tinge over the black. Heavens. There he was. Bertha squinted at the far corner of the room where the disguised detective was in animated conversation with a little red-haired man in the most abominable yellow checkered jacket. It took her a moment to guess who that second rumpled person might be. She walked closer to get a better view. Suddenly, it dawned upon Bertha that the little red-haired man was none other than William T. Stead. A reformer and a journalist who was making shocking revelations about the city's South Side. She had invited him on a whim. This was before any word of the Infanta's disposition had reached her. Bertha looked over her shoulder. Luckily, the princess was at the far end of the room and probably couldn't even see these two guests. Bertha turned tail and went back to make sure that the Infanta stayed as far from Stead as possible. Eulalia saw Bertha coming and muttered something that was not clearly heard. Either it was, "I can no more stay under the same roof with this innkeeper's wife" or "Pass me that butter knife." There grew to be two schools of thought in Chicago on what the princess had actually said. The debate raged in the letter columns of the Chicago newspapers for almost a year. Women stood at the lakeside in their white gauze dresses and lace-edged parasols, tightly corseted, to watch the yacht races. But in between sexual fainting and smelling salts, one could hear the telltale words. Butter knife. Innkeeper's wife. All summer the words floated out over the greenish-gray, choppy waves of Lake Michigan. The whole thing didn't really die down until the unfortunate ending of the Fair. After that no one cared. After awhile, even Bertha Palmer didn't care, since she was rather fond of the innkeeper. But momentarily, as Bertha approached the Infanta, there appeared an almost visible display of static electricity between the two grand dames. Eulalia started to demand her carriage in her most menacing Castilian. Bertha, no slouch at languages, managed to smile while spitting out beautifully enunciated Spanish words so hardedged that if they had been wood, she would have had a mouth full of splinters. Clifton W. Wooldridge picked just that moment to saunter across the salon and see what the ladies were up to. He sensed something in the air. Julia Ward Howe had been waiting to get a few words in with the Infanta. She had it in mind to ask about the condition of women in Spain, but she gave it up and walked over to the punch bowl. Everyone was backing off a few paces and pretending not to notice the exchange between Eulalia and Bertha. Marshall Field turned away and began chatting with the Vice President, Adlai Stevenson. One of the girls with a tray of canap�s approached Marshall Field. She looked vaguely familiar. As he reached for one of the caviar-filled snacks, the girl began berating him in a loud voice. It was something about Hull House and the starving prostitutes of Chicago. Women who were driven to prostitution by the total absence of a living wage as shop girls. And smallpox. "How about those sweatshop tenements where Field's custom cloaks were being sewn in rooms where contagious, deadly diseases were being spread? Well? What about that?" demanded the serving girl. Field grew flushed. His cheeks puffed in and out rapidly like a blowfish. "Madame, you are a termagant! You are an unsexed woman! I wouldn't talk to you at my office and certainly shan't do it here." Marshall Field swiveled around the girl, knocking her tray of canap�s out of her hand and onto his shoes. Seeing the mess on his fine leather shoes, he roared in disgust and shoved through the crowd. The girl continued haranguing his receding backside. "It is you and your crowd, Mister Field. You think that you are more moral than Charles T. Yerkes, but he only maims people with his cable cars. You stunt their spirits!" Clifton W. Wooldridge sprang at the girl and pinned her arms behind her back. Bertha Palmer had turned as pale as a cave cricket. Suddenly, the Infanta whisked up her white satin train and flounced into the gaping Mister Wooldridge, who was struggling to muzzle the unruly serving girl. The princess took one look at his disguise and the writhing blonde girl and began muttering to herself. "Ay, locomuy loco in cabeza!" Before anybody could stop her, the princess sprinted out of the ballroom and into the rain. Her carriage took her soggy royal self home to the hotel. The World's Greatest Detective telephoned over to the Harrison Street Station for a paddy wagon and took the disorderly girl into custody. William T. Stead phoned up a hansom. He knew Harrison Street Station well. What an interview this would make. Smelling salts were called for, but Bertha smiled bravely and continued the reception. They all sat down to a Spanish dinner and listened to Mister Sousa's band which alternated with a string quartet. The next day the whole thing hit the papers. Not the part about the girl with the pale eyes and hair who had spoken so rudely to Mister Field. Only the part about Bertha and the Infanta. Which was enough for the moment. After a few days, Marshall Field decided not to press any charges against that strange young woman who had accosted him at the Infanta's reception. The press always combed the court docket, for one thing. Another thing was that discreet investigations had disclosed that this Stevens woman was just one of those women who lived at Hull House. Harmless zealots. Field had a distaste for fanatics of all kinds, yet a sure instinct for what would cause the least stir. It was like the time that General Custer had been mown down by the Sioux. All the other businessmen in Chicago were emotionally involved in the tragic event. Field had calmly increased orders to his woolen mills in England. His reason was that a punishing raid would certainly be sent to the west. After that, settlers would pour in and the northwest markets would be open at last. To Field, everything had its business side. Weighing the girl's youth, Field decided that it made sound business sense not to prosecute. When such women married and settled down, they learned to behave themselves. The day arrived for The Infanta to bid Chicago good-bye. Clad in a straw sailor hat and a light linen costume, she bewitched the crowd as she stepped from the carriage and waved. She had a pixie smile. More people were on hand to see Eulalia depart than had been there for her arrival. This woman had dared to snub Bertha Palmer. Now that was something to equal the draw of the tattooed fellow from Borneo on the Midway. Eulalia smiled her innocent, pixie smile. The crowd cheered as the Saragossa Band struck up the Spanish Anthem. Eulalia distributed gold coins to some urchins in the crowd. Turning to the genial Carter Harrison, she expressed the wish that she could see this great and beautiful Chicago in thirty years. "It is a wonder now, but then, what a marvel it shall be... " Eulalia got on the train. Bertha Palmer let out the breath that she hadn't realized she had been holding.